I decided it was time for a look back over one of my art journals and the associated mini mission tags. 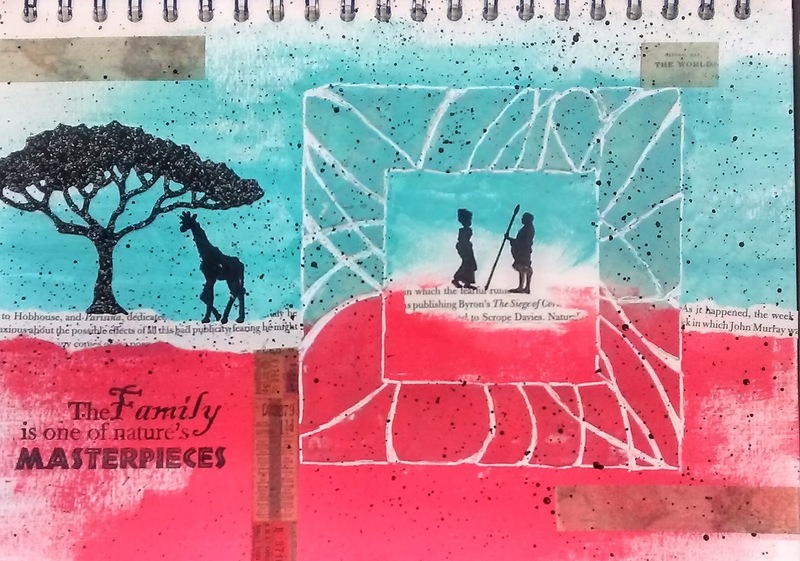 This one is a monthly journal following the prompts on Mission Inspiration. Although the prompts have been going since January 2016, I only joined the group in August of that year and in fact, my first ever art journal page was completed the same month following the 10 steps. I still have to complete November and December from 2017, otherwise I have kept up since that time. I also take part in the mid month mini missions, which are a more recent addition, but those I complete on tags. These follow a one word prompt (following the alphabet). The current prompt is Jazzy, which is next on my list to complete. My first ever art journal page. In January 2017 the format changed slightly: 8 steps, 3 colours and 5 prompt words for inspiration. I have left pages in my journal to complete November and December 2017. The next set of prompts will appear on the first Saturday in February. Mini Missions: A for Aquatic. The step by steps for all these projects can be found with a search for Mission Inspiration and/or Mini Mission on my blog. I look forward to continuing with this group!